We took the youngest of our little dogs to the vet early last week for her routine distemper vaccination. This dog really dislikes the vet. When she was a tiny puppy, the vet had to perform a series of painful procedures that the vet says the dog has never forgotten. When she sees the vet, she growls and seems very threatening and vicious, and the vet says the dog is giving her a well-deserved warning not to do that again! In any other situation this dog is the most gentle of souls, and she has never snapped at or bitten anyone, so we would like to keep it that way. It is always a relief when another vet visit is behind us. Anyway, the exam resulted in a glowing health report… perfect teeth, strong lungs and heart, and everything else we might hope to hear. Then, almost exactly five hours after the vaccination, one of us noticed that this dog’s face was suddenly swelling at an alarming rate. Within seconds her snout was easily three times its normal size and her eyes were swollen to mere slits. Worst of all, I think, was the way her head and face developed huge swollen areas and flaps of loose, hanging skin. We could barely see her eyes, but they were purple-red. It turns out that our little dog was experiencing a reaction to some part of the vaccine… the vet thinks it was probably the lepto part… which she says can cause a not common but also not rare reaction. Since our little dog is now seven years old and has had this combination of vaccines several times, the vet thinks that this time there was probably something of a rain barrel effect… and that she has probably had minor reactions each of the other times she was given that vaccine. Apparently another time the reaction will be worse… which the vet says is reason enough to take the lepto part out of the vaccine from now on. This was a pretty bad reaction and our little dog could have died… and that makes me mad. I understand the reason for vaccines. When I was a child, I knew a dog who died a long, lingering death from distemper, and it was a terrible thing to see. 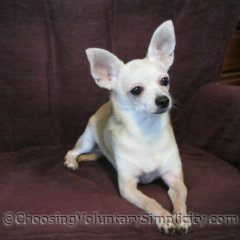 I certainly want our little dogs to be protected… but I hate putting them at risk… especially when the risk is from a vaccine for a disease that the vet agrees they would never be exposed to. It was awful to see our little dog suffering so badly, knowing she might die because we had agreed to let something be put into her body that could have killed her. 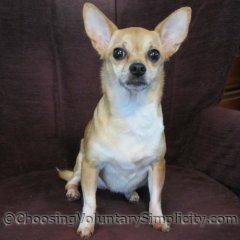 I have seen lots of Internet advice where people say not to let dogs have any vaccines at all, and I always wonder how that is possible to do. 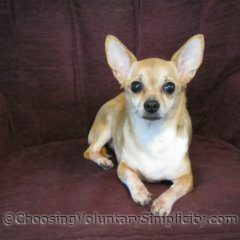 A rabies vaccination is required by the state, and any vet we have ever dealt with won’t give the rabies vaccination unless the animal also has a full range of other vaccines as well. We thought we were protecting the dogs against reactions by having a routine Benadryl injection given at the same time as the vaccine. Apparently the Benadryl does help, but it does not prevent the reactions, and dogs do sometimes die. 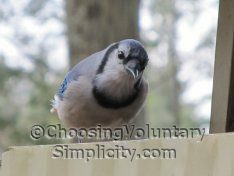 The very next day after that, we received a telephone call from the store where we buy the food for all of our animals. The manufacturer of the dog and cat food we buy has issued a recall for possible salmonella contamination, and we were told to check every bag of dog and cat food against a list of lot numbers and expiration dates. That time we were lucky… all the food we had on hand had been manufactured a week before the “bad” dates. However, it didn’t end there. A couple of days later we received a second phone call. It seems that the manufacturer had VOLUNTARILY expanded the recall because more testing had discovered more salmonella in other batches of the food. The most recent recall was expanded to include more dates and more lot numbers… and although we had bought one bag of the possibly contaminated dog food, we were lucky again because we hadn’t even opened the bag. All the cat food was supposedly still OK. I have to admit, I’m losing my trust in this company, which until now claims to have never had a recall. The food in question is a natural, premium, “human grade” food without additives, soy, or fillers and is highly recommended for little dogs like ours where nutrition is super important because they eat such small amounts. Obviously mistakes can happen, and this company is trying to correct their mistakes, but I can’t help wondering why they don’t test before the food is sold instead of after, when any contamination could have already killed or sickened the animal that ate it. We watched the fox (or were there possibly two?) run back and forth five separate times. 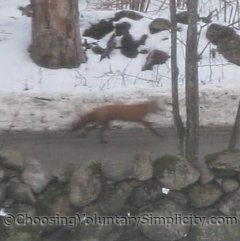 Each round trip took probably ten or fifteen minutes, and the fox was always running at full speed on the way back… and not quite as fast when it had the something in its mouth on the trip up the road. That something turned out to be a baby fox. I never knew this before, but red foxes make several burrows in different locations when the female is about to give birth, and they often move the babies from burrow to burrow if they feel threatened or exposed. I would guess there was a fox burrow somewhere across the field where the babies were born, and at least another burrow a considerable distance away up the road… and that day just happened to be moving day. We saw five babies being moved… I wonder how many we didn’t see. Apparently the red fox has an average litter size of four to six babies, although some litters can have as many as thirteen. Your dogs ARE sweet hearts! So cute! I’m with you on the vaccines. We actually didn’t register our dog during his entire life because I am that against giving animals vaccines. I’m not recommending you do this but I know several people who do. I’m glad your little dog recovered so nicely. We received the recall telephone call too. Probably like you we were on a list because we have a customer loyalty card. I had just brought home a bag of the catfood and it was on the list. I’m just so relieved I had not fed it to our cat who is like a member of our family. I agree the testing should come before the sale – not after. We went through the contaminated dog food experience during the crisis a few years ago and I’m sorry to say we lost our dog because of it. I know people often think these things always happen to someone else but when you are the someone else it’s a nightmare. I’m glad you didn’t have to go through this experience. Watch those dates carefully and keep checking. I don’t want you to experience what we did. I love your fox story. It must be wonderful to see all the wild life you do. It is our dream to move to the country and live closer to nature the way you do. You don’t know it, well I guess you do now LOL, but you are the inspiration for my husband and I. We yearn for a life like your’s and appreciate the way you share your story. So sorry about your dog’s reaction! I hope all will be well now and in the future. Very scary! 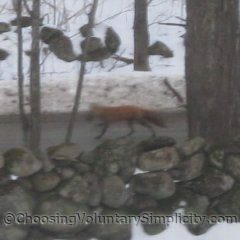 The opportunity to see a fox moving a litter is rare. What a gift! No wonder the adult fox is moving fast…imagine the anxiety of having your litter divided between two dens until you get the last one snugged into place with its siblings!